...3 weeks later and my cubicle makeover is still in the making. Slowly, but definitely coming along. Since this little renovation involves a ton of Pinterest inspiration, printables, online ordering, photo process of elimination, glossy paper, and a significant amount of silver metallic spray paint, I've decided to share my favorite addition to my desk with you.I'm a little ridiculous feeling the need for a bouquet of silk flowers on my desk, but when you tell me to make myself at home I'll take my shoes off too. Collecting dust in my garage is a God-knows-how-old box filled with various sized mason jars. I grabbed the largest one as well as the smallest and spray painted them metallic silver to go with my silver, grey, and teal color scheme as shown in my DIY Desktop Dry Erase Board tutorial. 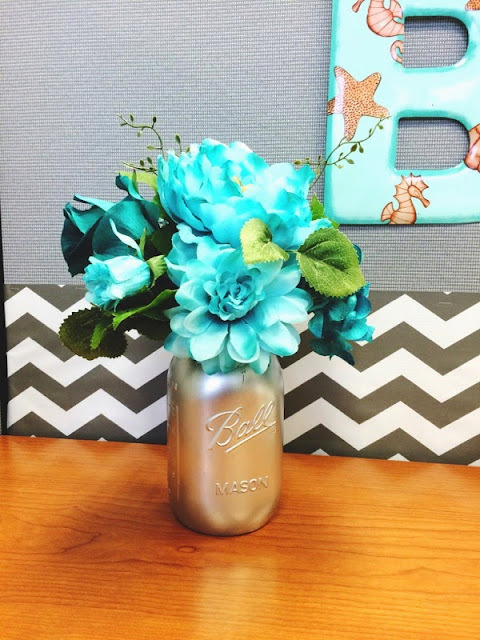 I found a 50% off teal bouquet of silk flowers on sale for $4.99 at Hobby Lobby for my large mason jar, and stocked up on some old school metallic Gelly Roll pens to store in my small mason jar. 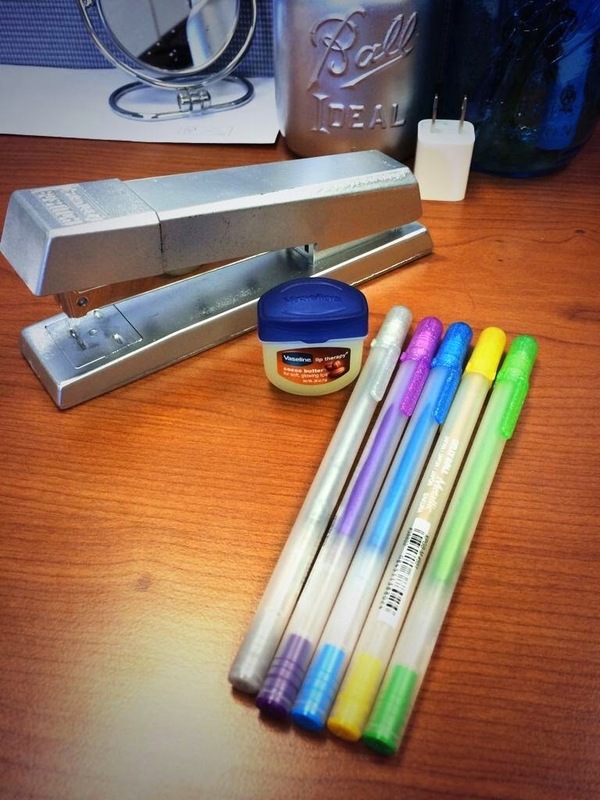 You can purchase the same 5 pack of Gelly Roll pens on eBay for $6.96 here. This craft is beyond easy and will jazz up any space, anywhere, at anytime. Metallic gold also looks amazing on any mason jar! Whether you throw some real flowers inside, trinkets, makeup brushes, or just tie a bow around, The options are limitless and a great idea as a gift.